The Riverina rice harvest has drawn to a close and while much of the discussion is about the size of the crop - for one PhD student it’s all about the quality of the grain produced. 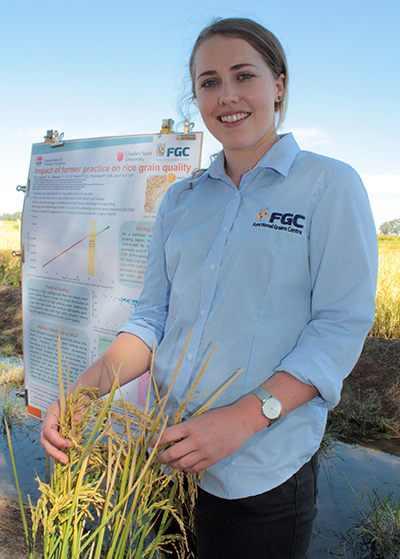 Charles Sturt University (CSU) PhD student and NSW Department of Primary Industries (DPI) researcher, Ms Rachael Wood, is investigating how rice grain quality is influenced by on-farm practices. The research is through the Australian Research Council (ARC) Industrial Transfromation Training Centre for Functional Grains (FGC) and Ms Woods said the aim is to identify strategies to help growers maximise their returns. “Payments to ricegrowers include grain quality parametres, in particular whole grain yield (WGY), that is the percentage of whole grain that resists breakage during milling,” Ms Wood said. “While a low harvest moisture can increase the risk of the grain cracking, we know that there are other factors that influence quality. “My research is investigating the impact of farmer practices like planting density, the rate and timing of fertiliser application and irrigation protocols on rice grain quality. The research also has the potential to provide valuable information about how to reduce water use without compromising the grain quality of the rice. “There’s a drive to increase water use efficiency in rice production, through strategies like dry sowing and delaying permanent water,” Ms Woods said. Ms Woods was awarded a scholarship by FGC. Funded by the Australian Government through the ARC’s Industrial Transformation Training Centres scheme, the FGC is administered by Charles Sturt University and is an initiative of the Graham Centre for Agricultural Innovation.